Composed by R. W. Smith, Grice, Swearingen, Huckeby, Shaffer. Solo. Solo book & accompaniment CD. Composed 2011. Published by C.L. Barnhouse (CL.080-3999-39). 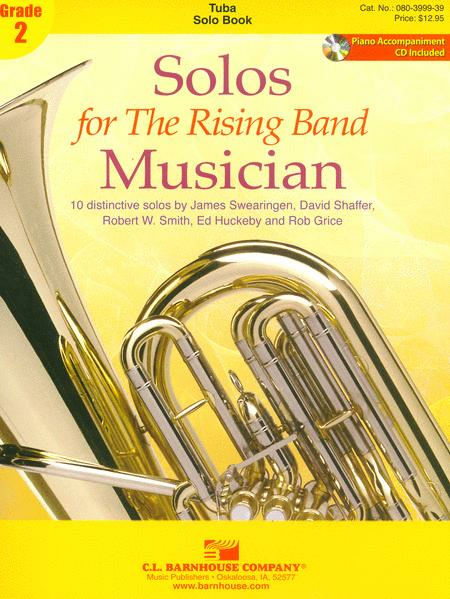 Consisting of 10 solos of various musical styles, "Solos For The Rising Band Musician" is a treasury of literature suitable for concert/recital performance as well as solo & ensemble festival. This significant new collection contains both contemporary and classic solos that will inspire and excite the performer and their audience. Each solo is written at a grade 2 level and is suitable for student study and performance after two years of experience. Solo books contains a CD with all piano accompaniments recorded by a professional accompanist, allowing for individual practice at any time. This valuable resource for the music educator and developing musician includes a solo collection for Flute, Oboe, Clarinet, Alto/Baritone Saxophone, Tenor Saxophone, Trumpet/Euphonium TC, Horn, Trombone/Euphonium BC/Bassoon, Tuba and Mallet Percussion. The Oboe and Horn solos are written in a different key to preserve the melodic content in a grade level appropriate setting. A separate Oboe/Horn piano accompaniment recording is included. 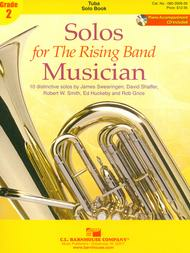 Educationally sound and musically rewarding, Solos For The Rising Band Musician will be a valuable addition to your library and yearly teaching plans. We give this our highest recommendation! CONTENTS: Axiom (Smith), Concertino (Smith), Danza Del Fuego (Smith), Too Beautiful For Words (Grice), The Gentle Mist of Spring (Swearingen), Prelude and Energico (Swearingen), Summer's Lullaby (Huckeby). In The Stars (Huckeby), Galop (Shaffer), Marche Militaire (arr. Shaffer).